Our School of Engineering is based in the Reynolds Building, adjacent to the well-equipped Brunel laboratories. 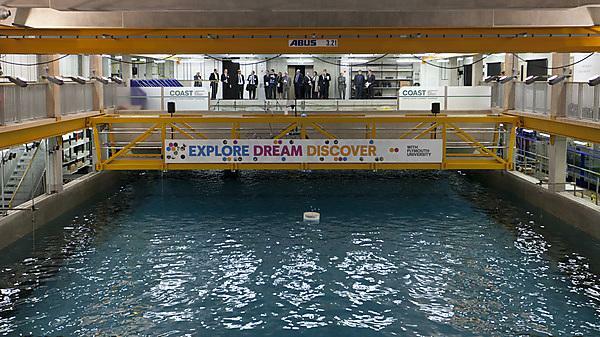 Located next door is our £19 million world-class marine facility, the Marine Building opened by HRH Duke of Edinburgh in October 2012, which provides some of the best research and testing facilities in the country. Our dedicated engineering computer laboratory is equipped with specialist software, so you’ll always have access to computers allowing you to develop important skills that will assist you academically as well as greatly improving your employment potential. Keeping you up-to-date with industry standard software is vital, so for example, we teach Computer Aided Drawing (CAD) software from your first year of study onwards. Our extensive library houses nearly half a million books, journals and other resources. It also features a computing area that’s open around the clock, a media work shop and study rooms. Drawing on both our expertise and our wonderful diving facilities, we can give you the opportunity to take the (HSE) Professional SCUBA diver training course as part of your degree. The course forms part of an official module in the second year of your degree and the selection programme comprises a stringent aptitude test, an interview and detailed medical assessment. Diver training is subject to availability and an additional cost. For more information about the HSE Professional SCUBA diver training course, please visit the Marine Station website.